The P50 service free extinguisher turned more than a few heads on the Safelincs stand at the recent Facilities Show at the National Exhibition Centre in Birmingham. Facilities managers who attend the annual event are always looking for innovative ways to cut costs and provide better service for their clients. They didn’t take much persuading to see the benefits and potential savings offered by the P50. Traditional extinguishers require servicing each year but P50s are constructed using a composite material that will not rust or corrode. This protects the contents and no discharge testing or refills are required for ten years. The expensive annual service by an external engineer is no longer necessary– just a straightforward yearly test that can easily be carried out by an organisation’s in-house staff. After ten years the P50s can be refilled and used for a further ten years. Safelincs has installed 54 service free extinguishers for a Sussex district council in a deal that will save it an estimated £20,000 over the next ten years. Unlike conventional extinguishers the P50 extinguishers do not require an annual service by an external engineer. They have been designed so that a simple check can be undertaken each year by one of the council’s staff, which is where the savings are made. The kitemarked P50 extinguishers are guaranteed for ten years after which they can be refilled and used for another ten years (most extinguishers need refilling after five years). The inner cylinder of the extinguisher is made from composite plastic which is cocooned by spun Aramid, the material bullet proof vests are made from. The metal elements are either brass or stainless steel which means that they are very strong and will not rust or corrode. All the materials used in the construction of the extinguishers are 100% recyclable. 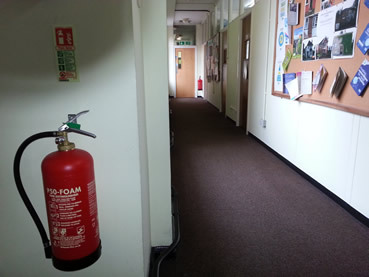 The council has taken mainly foam extinguishers but also has three powder appliances for specialist areas. With no servicing costs for the next ten years it will save in the region of £2,000 annually.